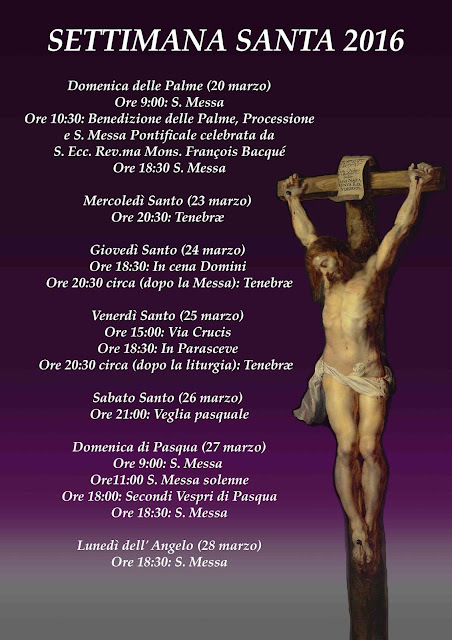 A reminder for all those who are fortunate enough to be in Rome for Holy Week: the Fraternity of St Peter’s Roman parish, Santissima Trinità dei Pellegrini, has for many years now sung the Passions of St Matthew on Palm Sunday, and that of St John on Good Friday, with the “turba”, the parts that represent the crowd, in the polyphonic settings of Victoria, a major highlight of two very impressive ceremonies; they also have one of the most beautiful altars for the Blessed Sacrament in the whole city. 10:30 a.m., Blessing of the Palms, Procession and Pontifical Mass celebrated by H.E. François Bacqué, titular archbishop of Gradisca, nuntio emeritus to the Netherlands.